Heat gas or charcoal grill. In small bowl, combine all butter ingredients; mix well. When grill is heated, carefully oil grill rack. Sprinkle each steak with garlic-pepper blend. Place steaks on gas grill over medium heat or on charcoal grill 4 to 6 inches from medium coals. Cook covered 12 to 15 minutes or until of desired doneness, turning once or twice. 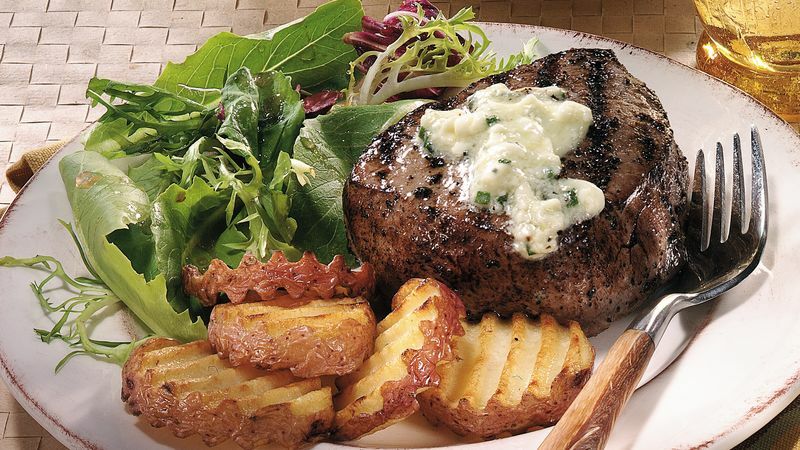 Serve steaks with blue cheese butter. A BBQ fork with built-in thermometer takes away the guesswork of checking to see if meats and poultry are cooked sufficiently. The fork is battery-operated and available at discount and kitchen specialty shops. Broiled Steaks with Blue Cheese Butter: Place steak on broiler pan; broil 4 to 6 inches from heat using times above as a guide, turning once or twice.